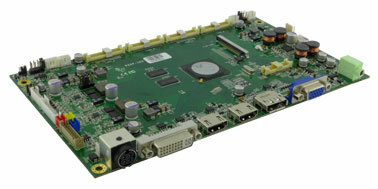 The Winmate R2AP is a powerful graphic processing board, providing High quality images for TFT panels from VGA (640 x 480) up to DCI 4K (4096 x 2160) and can be used in a variety of systems. The R2AP provides all A/D board key functions required for image capture, processing and display timing control, other functions include PIP / PBP – 4P function, Image rotation (90, 180, 270 deg. ), OSD rotation (90,270 deg. ), and Programmable 12-bit LUT. With all these functions integrated onto a single board, the R2AP is able to keep up with the cost of high-end multimedia LCD monitors while maintaining a high degree of flexibility and quality. This product is a high quality TFT LCD panel control board and R2AP is designed for large size and high resolution panel to meet the demanding performance of business and industrial applications. R2AP panel control board also integrates with various 4K panel brands as following.